Is It Yakisoba? Lo Mein? Pan Noodles? Tasty No Matter What…. 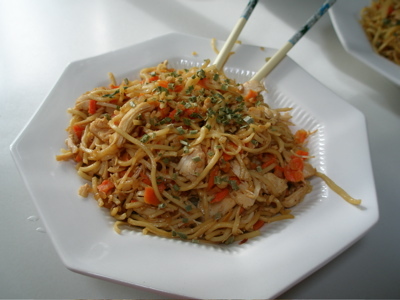 If there is one dish I love to stir fry up, it is pan fried noodles. Call it what you want, it comes under many names depending on what you sauce it up with and what kind of noodles you use as the base. Quick to cook up, and you can use fresh, canned, frozen – whatever vegetables you have on hand. Chuka Soba is found in the Asian section of grocery stores. It is similar to ramen but is not deep fried. Look carefully and you can find versions that are not artificially colored. You can use thin spaghetti or ramen instead as well. The sauce ingredients I honestly feel that everyone should have in their cupboard at home. Rice vinegar and sesame oil are also found in the Asian section as well. I call for lower sodium soy sauce – you won’t miss all the salt! As for the dried vegetables? I keep quite a few on hand – they are great for when all you need is a Tablespoon or two. No waste, no running to the store for one item. Just rehydrate them for 15-30 minutes and proceed. Cover the dried vegetables with boiling water and let steep till needed. Bring a pot of water to a boil (couple quarts), add in the Chuka Soba and bring back to a boil. Cook for 3 minutes, then drain. Meanwhile in a wok or large high sided pan, heat up the oil over medium high heat. Drain the vegetables well and dump in. Stir fry for a couple minutes till the shallots start smelling done and the first hint of brown is showing. Add in the chicken and break apart, while constantly stirring. Add in the noodles and keep stirring/shaking the pan. Don’t stop or you will get burnt noodles! Do this for a minute or two. Cut the heat and add in the sauce. Stir as fast as you can, tossing the noodles till well covered. Plate up and garnish with chives if desired. The Lo-down: chuka soba is made from wheat or buckwheat and wheat flour, and are not fried. So, just like we came to the conclusion, it is Japanese wheat noodles, which are not fried. I think it’s time for a shopping trip to Uwajimaya!